I went on to explain how while I think the fundamentals taught to students in school are paramount, the opportunity for today’s education is still undermined. Students are missing essential skills to be successful in this new digital age. But I’m not writing this article to complain about our current school system. I want to provide a real solution. Interview successful professionals on my Podcast to share what they believe students should be doing to prepare for this new era. Provide online and live in-person presentations educating parents on the knowledge I have gained. Offer a year-long program for teenage & College students to enroll into to master this digital age knowledge. What do I mean “Digital Age”? And what is “Digital Age knowledge”? …to enable to you have broader opportunities, more fulfilling relationships, and an affluent life. Tom Peters made this prediction back on August 31, 1997 in his article on Fast Company called “The Brand Called You“. Why does this matter for my 8th grader you may ask? You may think this is something they don’t need to worry about until after college. Wrong. Your student is already personally branding themselves to the world on daily basis. You know the social media apps called Facebook, Snapchat, Twitter, Instagram, You Tube, Pinterest? What your students post on social media can easily reach at least 1000+ people, every day. 15 years ago a company was excited to be reaching 1000+ people daily. Now your 8th-grade student can do that without even knowing it. A common response to this knowledge is to block your student off from all social media. That way, they can’t damage their reputation and they stay safe from the people you don’t want them to talk to… right? Actually, this is wrong again. People are naturally wary of change… but to be successful, we need to embrace it. You are holding your student back if you cannot do so. Turn the problem into an opportunity. How can my student make the best of this reach they have daily? How can they use it to develop a following and become a leader and authority figure in a particular field of interest…enabling them to have more opportunities, more fulfilling relationships, and a more affluent life? Educate your student. Show them how what they post on social media can have either a positive or negative impact on their life. Then, follow them via social media but don’t like or comment on their post! You could embarrass them, and they may restrict what you see. I started this blog about four years ago. I studied everything Neil Patel posted on his blog, Quicksprout, on how to rank via SEO, how to write compelling content that people shared, how to connect to influencers and more! Fast forward to today… this blog gets close to 100,000 unique readers every single month! (You may be one of them right now.) Some of whom end up becoming clients of ours! 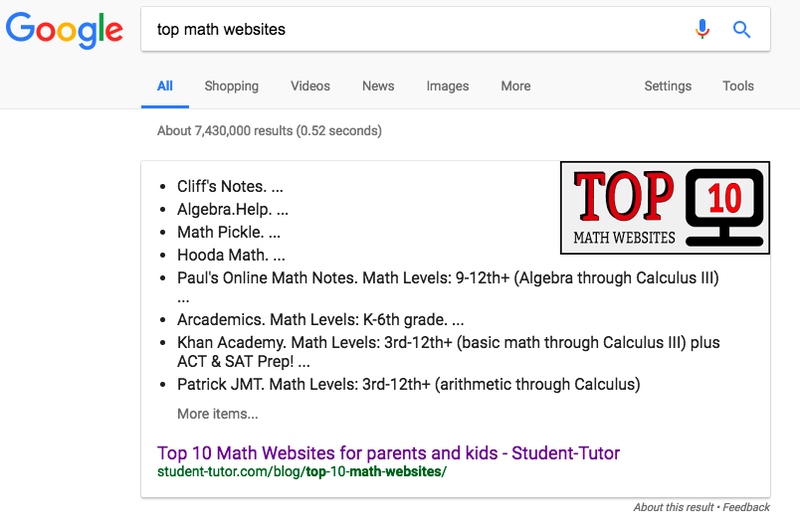 In fact, if you google the generic term “top math websites”, “SAT reading strategies” or “how to get into UC Berkley” “Top areas to focus on” you will see us ranking #1! I even got the opportunity to become a writer for The Huffington Post, speaking opportunities at high schools, invitations to speak on over a dozen podcasts, the news, and more! Did I mention I am only 27 years old? Learn five ways blogging skyrocketed my business. Stand out from the pack to get into schools like Stanford + earn thousands in scholarships. Sell their product or service. Be an affiliate and sell someone else’s product or service. Use that network to land incredible internships and jobs. Too much pressure for an 8th grade student? Then don’t make it a job! Make it fun. That leads me to step 3. If your student loves football, have them interview their football coach and write about it! If they love video games, have them reach out to professional gamers and write about it. If they love robots, they can interview engineers and write about it! More importantly, it’s to help your student explore what they are curious about, learn more about themselves and force them to make decisions to creatively learn on their own and increase their internal locus of control (motivational levels) and self-efficacy (confidence). 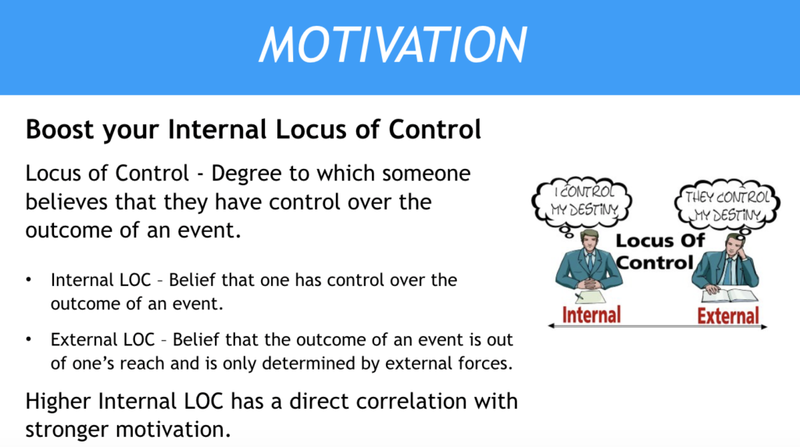 People with an internal locus of control believe they are in control of the events affecting them. They tend to blame or praise themselves for their success or failure. Contrary to these individuals are those with an external locus of control. They see themselves as affected by the actions of the outside world, and blame or praise forces that are beyond their control. Studies have shown that people with high internal locus of control that tend to be less stressed, have higher motivation levels and seem to have greater professional and personal satisfaction. With school being so standardized, it is harder than ever for students to creatively make decisions on their own and increase their internal locus of control. In fact in a recent Forbes article, it stated that 40% of high school students are chronically disengaged. Teenage students are not motivated because of the system they have been brought up in. Step 4: Share to the world! Ok great! Your student went out and interviewed someone about something they were curious about and wrote a blog article on what they learned. Remember when I was saying your student can reach 1000+ people daily? Now it is time to blast out that article they wrote to their entire following! Best part: No OTHER student is doing this. So parents are going to share YOUR student’s article like wildfire. Over time, your student’s friends, followers and random people will find their content online and will start to see them as an expert in their topic of curiosity. Their audience will start to grow exponentially. Now imagine your student applies to Stanford and in their application they talk about how they have a following of 60,000 people for STEM-related topics. Stanford is going to be begging your student to go to their school AND any company that has a similar audience is going to be begging them to help sell their products to your audience. If they keep this process up throughout college, by the time they graduate they’ll have a following close to 100,000 people. That’s 100,000 people reading what your student writes per month! Get 1% of those individuals to give you $10 every month and they’re making $10,000 per month or $120,000 per year. All because in high school your student decided to follow their curiosity and write about it. Don’t have your student do this to make money. Give them the opportunity to be curious, learn/grow, and develop a strong network by following these 4 steps. Have them share to the world! They will develop a strong network, boost their college resume, maximize their scholarships, and even make an income! Are you interested in learning more and joining our year-long program with an ambitious teenager from across the world where I personally work with your student to ensure success?! Click Here To Learn More About The Student-Tutor Mastermind Program.